John Morra and Al Logan. This past weekend at the Corner Bank in Scarborough, Ontario the first event of the newly formed Falcon Cues tour was held. 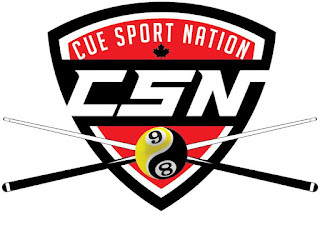 The event featured $2000 in added prize money consisting of a cue donated by Falcon cues. Steam Whistle Breweries, Simonis cloth, Aramith balls and Diamond billiard where also contributing sponsors. This is the first tour in Ontario in a number of years that has added money from outside companies and promises to bring higher prize funds with players competing for more than just each others entry fees. 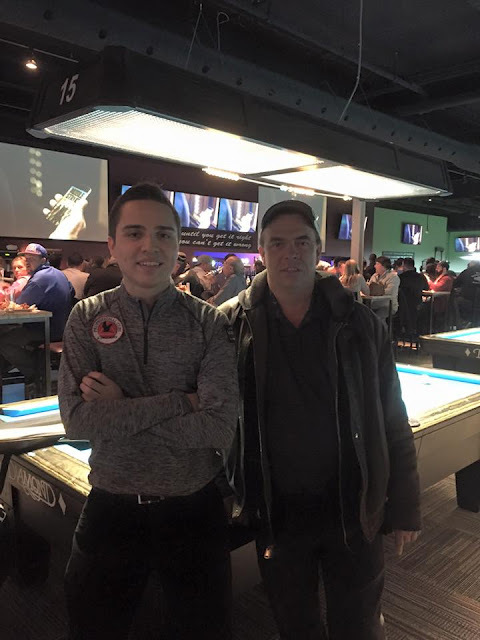 Within a year of opening, the Corner Bank has quickly become the premier place for competitive pool in Toronto. The tournament was played on 12 pro cut 9 foot diamonds, the room also has 16 7 foot Diamond bar tables and 8 Schender snooker tables. This weekends event saw players grouped in levels ranging from A, AA, AAA, semi pro, and pro divisions in an attempt to unify the rankings between Ontario and Quebec. The format was 9 ball alternate break, rack your own, $65 entry fee and $20 tour membership fee which will be put towards the season ending finale. 24 players showed up for the first event including many of the top payers in the province. John Morra headed up the list of favorites along with myself(Erik Hjorleifson) and Mario Morra. Al Logan, Rob Hall, Naomi Willams and Carlin Sanderson were also in the mix in this very strong field. Saturday play began with a match up between Mario Morra and myself in round two, this one went down to the wire and Mario came out on top with a 10-8 victory. John Morra had his hands full with the newly promoted semi pro Carlin Sanderson in a 10-8 race match. Morra came out on top in this one with a 10-6 victory, next up for John was multiple time Canadian women's champion Naomi Williams, in a 10-7 race John won a close one with a 10-5 final score line. Al Logan and newcomer Jun Briones advanced undefeated on the other half of the draw and Mario Morra would play his son John rounding up the final four on the winners side coming back on Sunday. On the losers side I would return after defeating Naomi Williams in the 7th place match and Carlin Sanderson defeated Stefane Godhino to return to Sunday play. The first match of play on Sunday was a classic seeing John Morra slide past his father almost 40 years his senior after Mario was kicked in on the break in the hill hill game. Al Logan also bested Jun Briones to move on to the hot seat match with Morra. In the 5th place match I would get my revenge on Mario after losing to him in the first round and Sanderson defeated Briones. I went on to defeat Sanderson in the fourth place match ending a strong run for the steadily improving young gun. Morra ran over Logan playing nearly flawless setting up a losers side final match between me and Al. Logan started out this match on fire breaking and running 3 of his first four breaks and maintained a high level throughout the match. He has been a top player for years in Ontario and has experience on the international scene, it was nice to see him in form this weekend. In the finals Morra proved once again to be to strong finishing off a great performance in style with a 10-2 victory, becoming the first ever Falcon Cues Ontario Tour champion. Morra is also sponsors by Falcon Cues and if you are interested in purchasing a cue or have any questions about their products feel free to contact him through Facebook. Special thanks to room owners Jim Wych and John White for running the tournament this weekend and to everyone at the Corner Bank for orchestrating this new tour. It promises to be an excellent addition to the Toronto pool scene.